Should flu shots be mandatory for healthcare workers? Should flu shots be mandatory for healthcare workers? The answer is a resounding “yes”. During the 2011-2012 flu season, two-thirds of healthcare workers received flu vaccines. That left one-third of healthcare workers with the possibility of contracting and spreading influenza amongst their coworkers, patients, family, friends, and strangers. The best way to prevent transmission is to get vaccinated. If we can’t be trusted to do this, it should become mandatory. Our role as healthcare providers includes patient teaching and education. How can we advise our patients to do something if we refuse to do it for ourselves? Perhaps, first, we need to get educated on flu facts and evidence-based medicine. 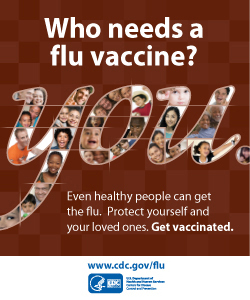 To get the facts, visit the CDC site, the WHO site or flu.gov and learn why there is no excuse to refuse the flu shot. More facts and information are available here (about the flu) and here (flu information for healthcare workers). Unvaccinated healthcare workers who contract influenza cost the already overburdened system a huge amount of money in sick pay, medication, medical visits, etc. – not just for their illness, but exponentially for every person who becomes ill as a result. Healthy adults may be able to infect others with the flu up to 1 day before they start having symptoms. And once sick, they can infect others for up to 5 days. Our patients count on us to help them get well, not make them sick. Get a flu shot today.